Yep, Ocean Market Grill has to be one of the more random meals I've had in recent times. I will say that I wasn't a fan of the super generic name, which I can only assume was chosen because it can be acronymized to "OMG." 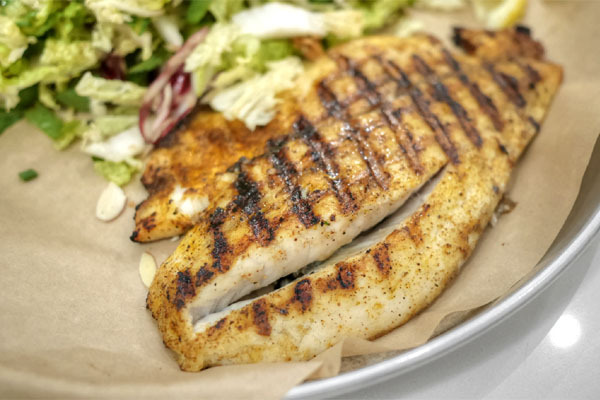 Opened at the end of April last year, the restaurant is of the fast-casual fish grill genre, and there was pretty much no reason for us to come here except that (1) we were in the area and, more importantly, (2) we'd heard that they were BYOB-friendly. OMG occupies the former home of Greek eatery Chicken Dijon. Inside, things were nicer than anticipated, casual sure, but also surprisingly chic. There's an appealing patio seating area out front too. 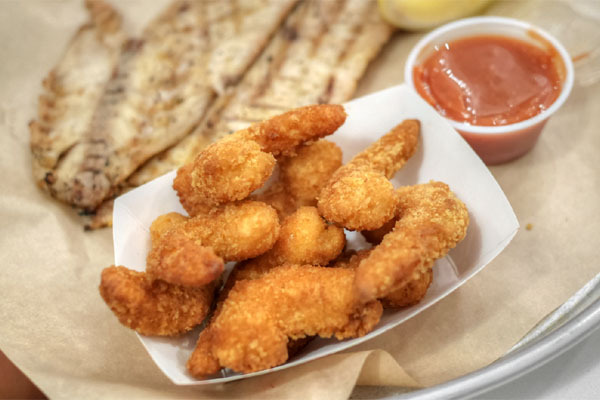 As for the menu, expect a wide selection of wild and sustainably-farmed seafood items in a multitude of formats, all with oddly specific prices. To drink? Not much, fountain sodas basically, hence the BYO-ing (I did notice beer and wine advertised on a menu, but I'm assuming they haven't implemented alcohol yet). Click for larger versions. 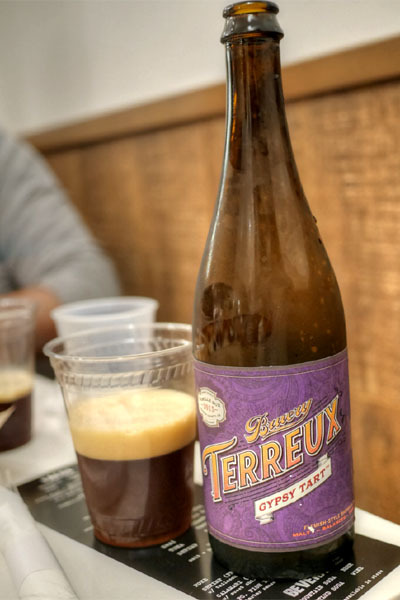 We got started quickly with the beer, bringing out the newly-released 2015 The Bruery Terreux Gypsy Tart. It's the brewery's take on a Flanders brown ale, and thus conveyed lotsa malt 'n' dark fruit, with some oak in there and just enough tartness toward the end to keep it from becoming too heavy. 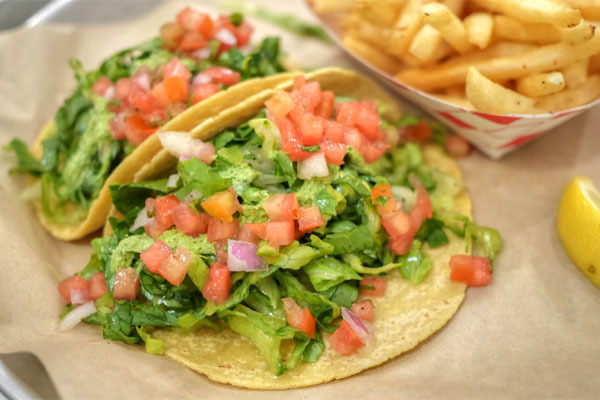 We made sure to try all four taco types, naturally. 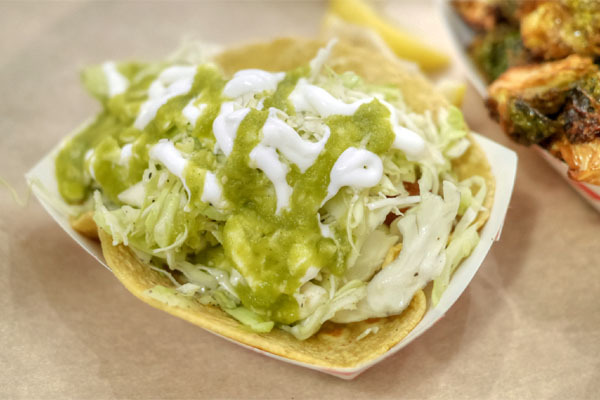 The shrimp variant was pretty textbook, but worked well enough, with the crunch from the cabbage and contrasting notes from the cream and tomatillo making sense. I would've liked a thinner batter on the actual shrimp though. 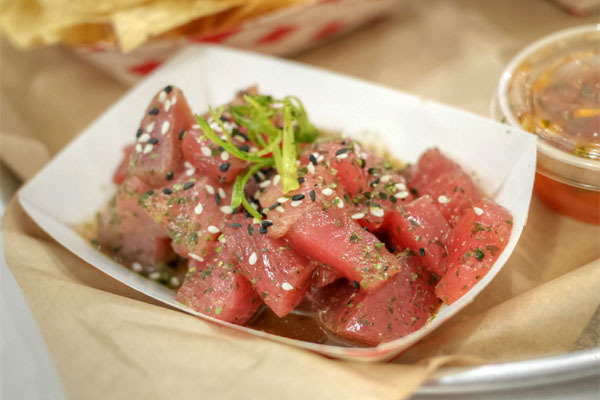 Poke's all the rage these days it seems, so we weren't surprised to see Ocean Market's take on it. It was a solid offering, the cubes of tuna coming out firm, clean, and well-matched to all the sweet, tangy, nutty nuances present. Nice textural play provided by the tortilla chips, too. 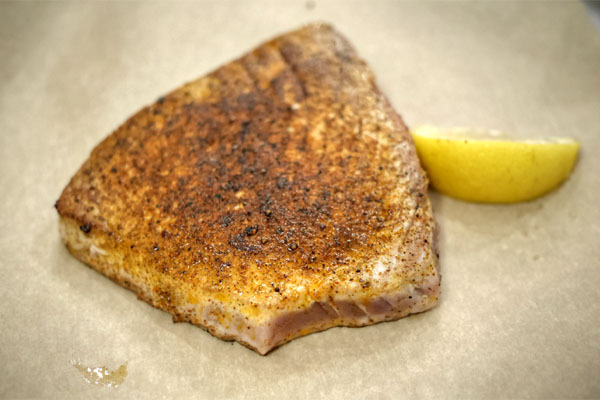 Tuna was lightly seared, coming out cool to the touch, with the fish complemented, but not dominated by its crust of Cajun-y spices. 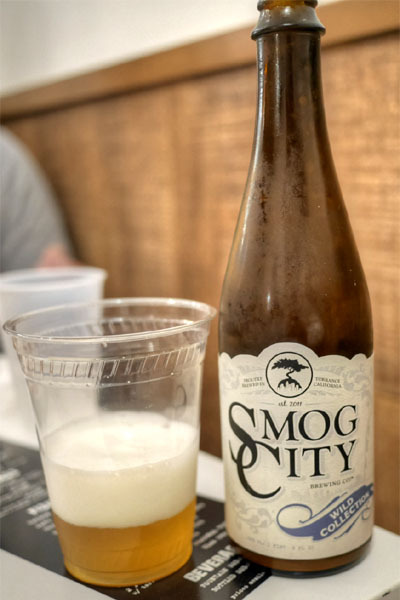 Our sole India pale ale was the 2015 Smog City Steamfunk Brett IPA, and it was an unconventional one, fermented with Brettanomyces and dry-hopped with experimental hops. At first, I tasted the tropical, citrusy notes you'd expect, but this was backed by a bevy of earthy, barnyard flavors from the Brett that made this one of the more intriguing IPAs I've had. 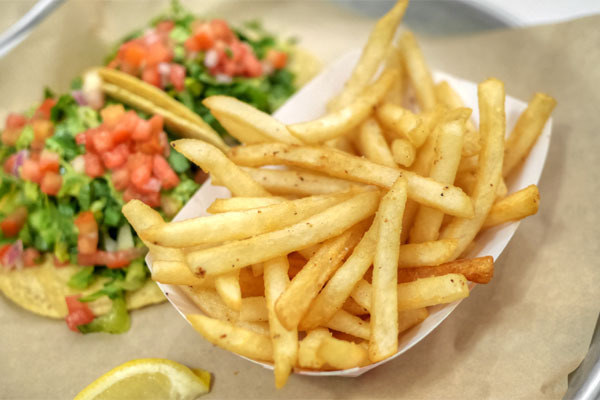 Fries reminded me of Jack in the Box's (not a bad thing mind you). 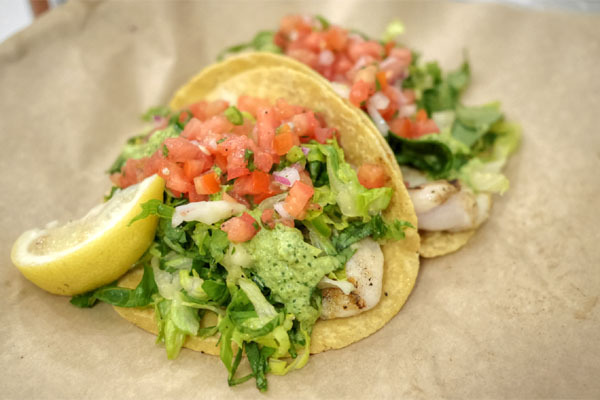 Mahi made for a nice taco: lean and slightly firm to the bite, with a good char and slight sweetness, the veggies up top providing brightness and acid. 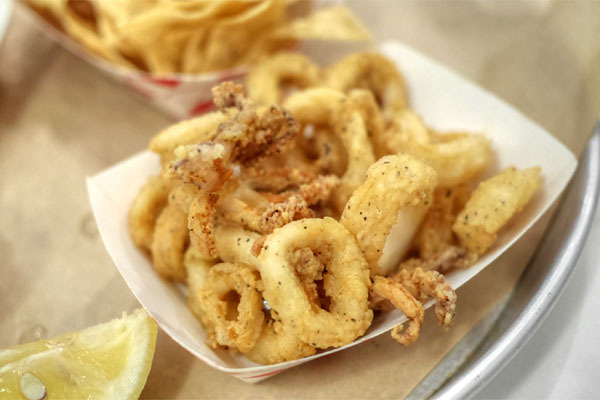 The fried calamari was about par for the course, with the accompanying sauce imparting a welcomed zippiness to the squid. As always, I tended to prefer the tentacles. 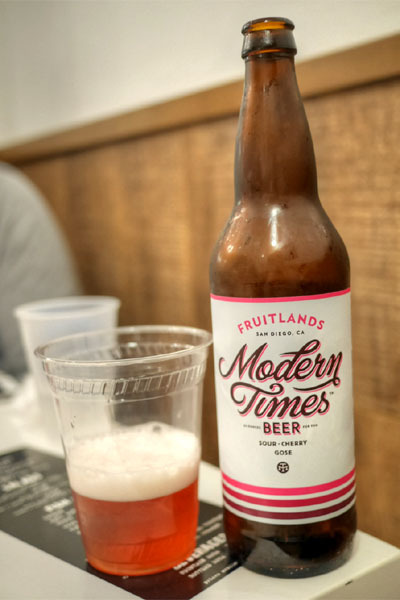 Next to drink was the 2015 Modern Times Fruitlands, a sour cherry gose. I was a fan of this one, finding its tart fruit and citric flavors a great pairing to the beer's salty backbone. Yellowtail was nicely textured and quite briny, but not in an off-putting way. The S+P was key here in providing a semblance of balance. Here we had what basically amount to the "fish" part of fish and chips. 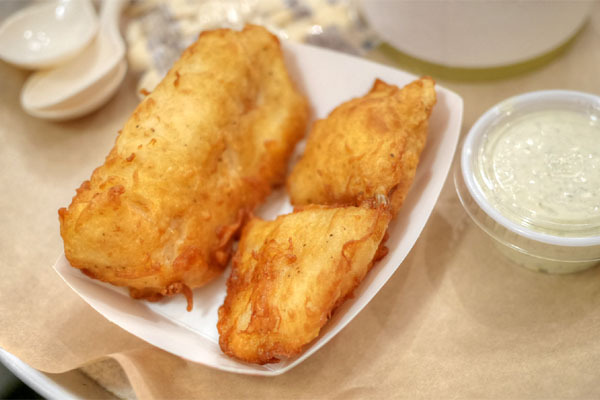 Prepared with wild cod this evening, the dish met expectations: moist, flaky, and lean, with a nice crispness from the batter. 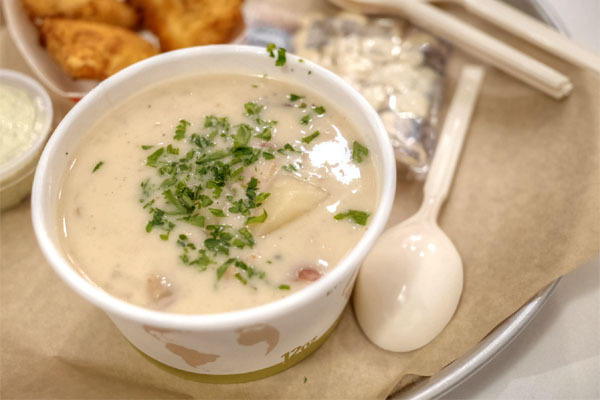 The chowder was better than anticipated: as creamy and cozy as you'd want, loaded with hearty chunks of potato and spongy shards of clam. A little reminiscent of Campbell's, but better. 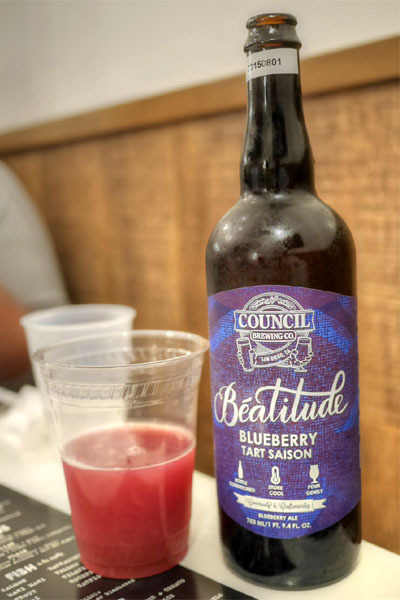 The 2015 Council Blueberry Beatitude was another sour, a blueberry-infused tart saison. I found it a lightweight, refreshing, gluggable beer, sour and slightly barnyard-y, with a base of subtle berry flavor. 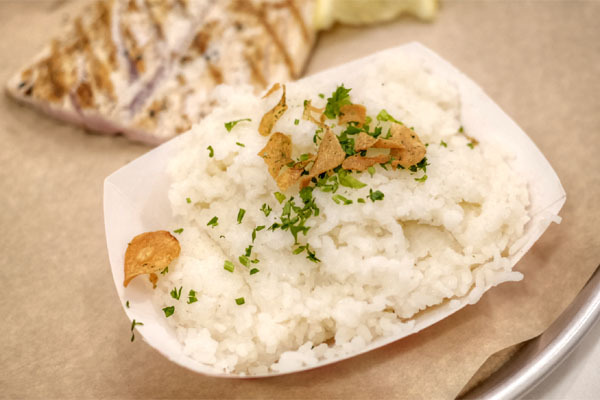 The rice was far, far too overcooked, arriving almost pasty in consistency, without enough of the advertised garlic character. 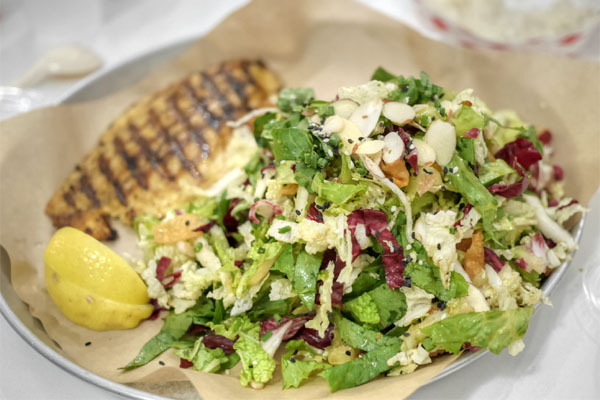 The requisite "Asian" salad hit the mark for the most part, a mix of crunchy greens bound together by notes of nutty sesame and a sweet-n-sour dressing. 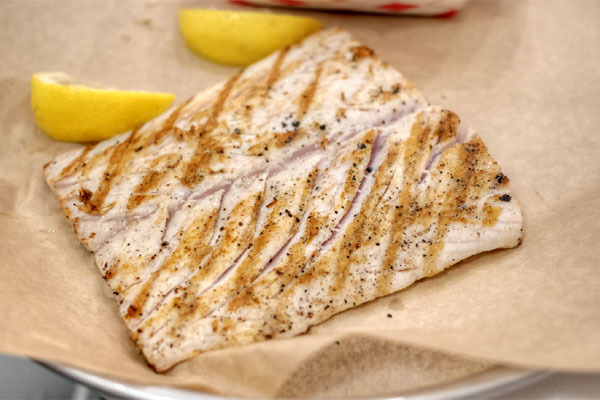 Barramundi was firm, flaky, mild to the taste, the blackening spices giving a much needed jolt of flavor to the fish. 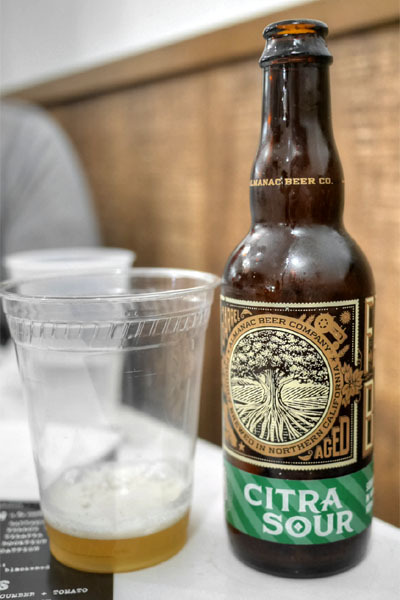 The 2015 Almanac Farmers Reserve Citrus was the first of two beers from the brewery, a sour blonde with Buddha's hand citron, yuzu, and blood orange, aged in wine barrels. It was lovely, smelling of aromatic, juicy, zesty citrus fruit and tasting much the same, with a bit of funkiness backing everything up. Here, the fish conveyed a sweet but sort of blunt flavor profile, so the brightness of the greenery was absolutely crucial. 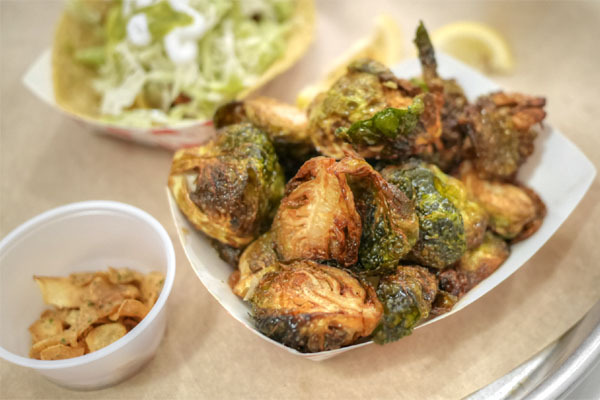 Brussels comprised the seasonal veggie this evening, a surprisingly good rendition that really showed off the bitterness, char, and texture of the sprouts. 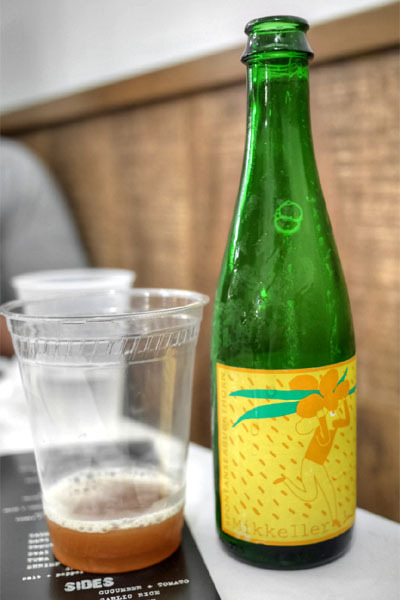 I wasn't feeling the Mikkeller SpontanSeabuckthorn, a lambic style beer brewed, as the name would imply, with sea buckthorn. It was sour, sure, but also had an astringent quality to it that I found perturbing. Do not want. 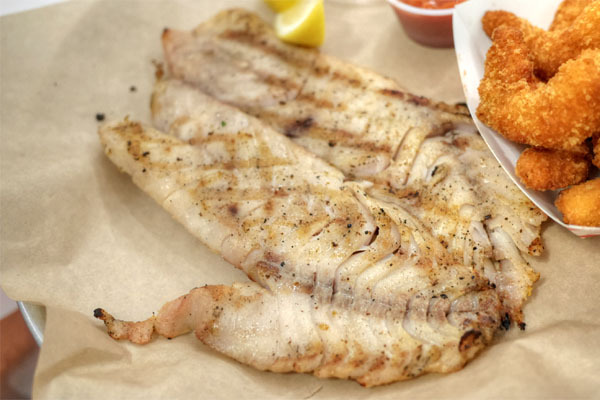 Rockfish was on the nondescript side. Not too much to say here. 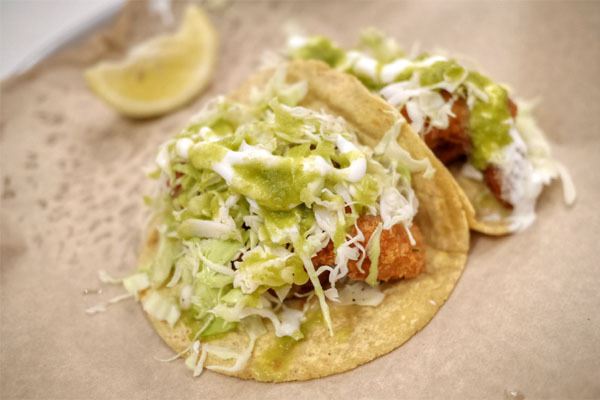 The fried tilapia made for a classic, though not particularly memorable fish taco experience. 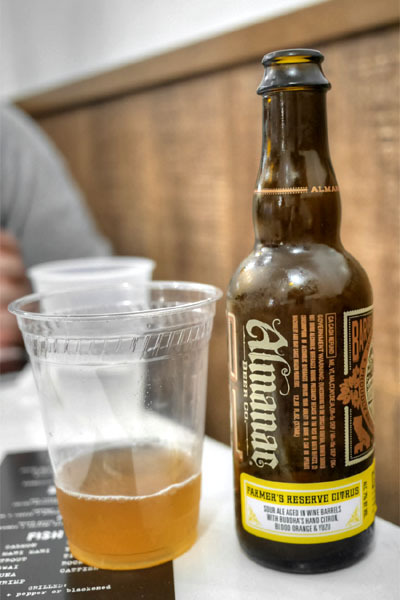 A single-hop, dry-hopped sour blonde aged in wine barrels, the 2015 Almanac Citra Sour delivered, its juicy, citrusy, bitter hop character melding well with the inherent tartness in the beer. Fried shrimp were the same ones used in the taco above I imagine. Pretty good with a dab of the horseradish-y cocktail sauce. 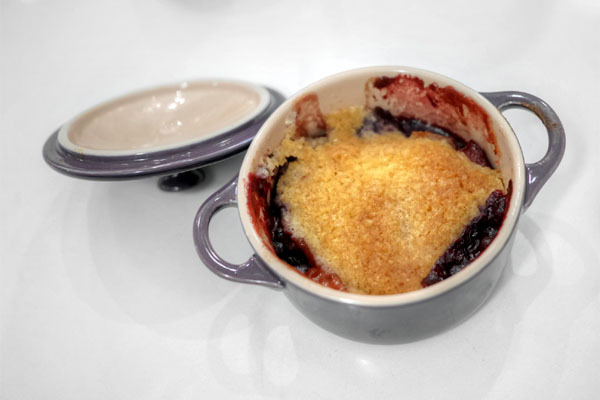 There was no dessert here, so we made do with some delightful homemade blackberry and nectarine cobblers, each served in its own miniature Le Creuset cocotte. Our final beer was the heftiest of the bunch, the Vietnamese-inspired 2015 Perrin No Rules, an imperial porter aged in oak bourbon barrels with coconut and turbinado sugar. It made for an appropriate conclusion to the meal, a massive, viscous brew with a huge nose of chocolate, malt, and vanilla. On the palate, I got loads of sugary sweetness up front, leading to roasty coconut and an undercurrent of boozy barrel character. Really damn good. We had a fun time at Ocean Market Grill, though a lot of that may have been due to the booze. 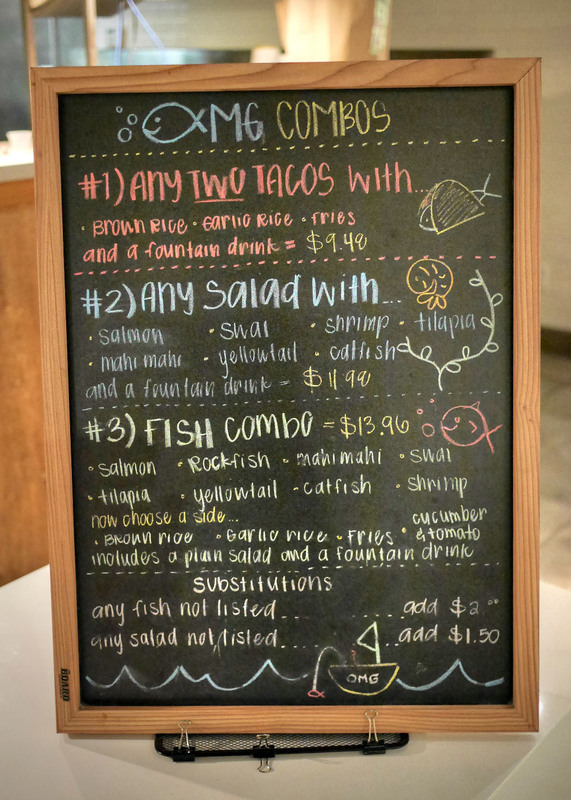 In terms of food, the cooking here delivers what one would expect for a fast-casual sort of place--not superb, but decent, and I definitely appreciated the sheer variety of seafood available too.